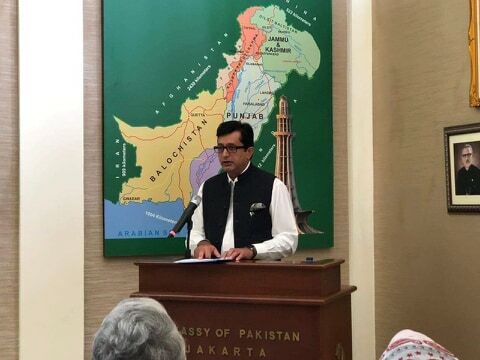 Jakarta: March 23, 2019- he National Day of Pakistan was celebrated on 23rd March 2019 with national fervor and enthusiasm at the Embassy of Pakistan, Jakarta, in a simple but impressive ceremony attended by a large number of Pakistanis and Indonesians of Pakistani origin. The function commenced with the hoisting of the National Flag by Ambassador Abdul Salik Khan. Subsequently, the messages of the President and the Prime Minister of Pakistan, received on the occasion, were read out. Speaking on the event, the Ambassador highlighted the government’s priorities of progressive, secure and economically vibrant Pakistan and shared government’s achievements during the past year. He reiterated that in line with the guiding principles of Pakistan’s Foreign Policy, the government was keen to improve its relations with all countries of the world, including India, which is reflected in the de-escalatory measures adopted by Pakistan recently. The Ambassador expressed his satisfaction over expanding bilateral relations between Pakistan and Indonesia, which have received further impetus after President Joko Widodo’s visit to Pakistan in January 2018. For the first time, bilateral trade between the two countries has crossed US $3 billion mark in 2018. He emphasized the Pakistani businessmen to explore opportunities to further increase exports to Indonesia particularly in the additional 20 tariff lines made available to Pakistan from 1 March 2019. Emphasizing the importance of people to people contact, the Ambassador referred to the e-visa being launched by the government of Pakistan to the Indonesian nationals, and urged the community to help promote tourism. He urged Pakistanis living in Indonesia to play their role in furthering our friendly ties in all domains by engaging with Indonesians at all levels.